What is Christmas in Asia like? Is Christmas even celebrated in Asia? Read about the different Christmas in Asia celebrations below. How is Christmas celebrated in China? In China, only around 2% of people are Christians, so the real meaning of Christmas is relatively unknown outside of major cities. Chinese Christians will go to their local state run church for midnight services in a variety of languages. Christmas is not known as an official holiday in China, so most companies, schools and commercial centres are open. Department stores are decorated with Christmas trees, thousands of lights and festive decorations. Store employees will often wear Santa hats. It’s not uncommon to see Father Christmas – known as Shen Dan Lao Ren – at shopping centres and hotels, where children can visit him and receive a small token gift. An increasing number of Chinese people celebrate on Christmas Eve by eating dinner with their family and friends, where exchanging Christmas cards and small gifts are becoming more popular. A popular tradition on Christmas Eve is giving apples because in Chinese language, Christmas Eve is called ‘Ping An Ye’ and the word for apple in Chinese is ‘Ping Guo,’ which sounds similar. Traditional western Christmas dinners are readily available at hotel restaurants and western restaurants during Christmas in China. Supermarket chains catering to foreigners sell all the ingredients needed for a home cooked Christmas dinner. Eight treasures duck – the Chinese version of a stuffed turkey – is also enjoyed. 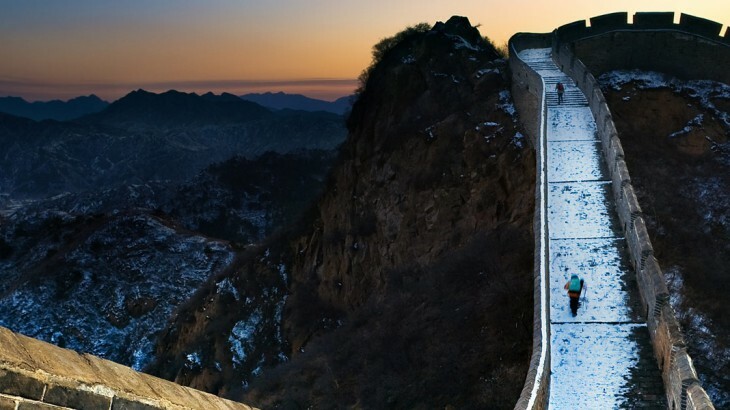 A holiday to China in winter is a sight to behold and a nice time of year to visit due to low crowds. However, the temperatures can drop very low: as low as -20 degrees centigrade in Beijing! How is Christmas celebrated in Vietnam? Although a predominantly Buddhist country, the Christmas period in Vietnam is classed as one of four main annual religious festivals, which includes the Lunar New Year, Buddha’s birthday and the mid-autumn festival. Similar to Italian culture, Christmas Eve is more important and more celebrated that Christmas Day in Vietnam. It’s a huge event and celebrated with lots of fun and fanfare regardless of religion. Hotels, department stores and shopping centres will put up lots of decorations and sparkling lights, and many streets will also be lit up with festive lights. In the main cities of Hanoi and Ho Chi Minh, cars and other vehicles are banned from the city centre, allowing people to crowd the streets and celebrate with confetti. Christians in Vietnam attend a Midnight mass where many churches, including the Notre Dame Cathedral in Ho Chi Minh City and the St Joseph Cathedral in Hanoi, have huge nativity scenes where people gather round to pray. After this religious service, they celebrate with a large family meal and eat bûche de Noël (chocolate log cake) for dessert. Vietnamese children tend to place their shoes outside their front door on Christmas Eve, willing for their shoes to be overflowing with treats from Father Christmas’ sack on the morning of 25th December. How is Christmas celebrated in Cambodia? Only 2% of Cambodians follow the Christian faith. They celebrate traditionally by attending Church and organising a Christmas gathering for their friends and families. They read the Bible, sing prayers and many children perform Nativity plays. Many Cambodian Christians will decorate a Christmas tree, but it’s merely for decoration and has no religious significance. However, many Cambodians of other faiths – such as Buddhism – will celebrate Christmas in a non religious manner. From the middle of December, Christmas cards are exchanged among youngsters, gifts are given to friends and partners, and Christmas trees and decorations can be found in most public places in the main cities of Cambodia, such as inside shopping centres and restaurants. The peak tourism season is one of the main reasons why this western festive period doesn’t go unnoticed. Regardless, it would be a very hot and humid Christmas! How is Christmas celebrated in Japan? Similar to other Asian countries, Christmas is not widely religiously celebrated in Japan as not many people are Christians. Christmas is known as a time to spread happiness rather than a religious celebration. However, several Christmas traditions have come to Japan from the USA and it is becoming increasingly popular. Cards and presents are exchanged, and American fried chicken is often eaten on Christmas day. It is the busiest time of year for restaurants such as KFC, where people place orders in advance! The traditional Japanese Christmas food is Christmas cake. Rather than it being a fruit cake, it’s a sponge cake decorated with strawberries, whipped cream, flowers and a figure of Father Christmas. Shops and streets are decorated with lights and Christmas trees, and there’s lots of festive cheer. As in Vietnam, in Japan Christmas eve is often celebrated more than Christmas Day. Christmas Eve is known as being a day of romance, in which couples spend precious time together and exchange presents. Couples like to go for long, wintery walks to admire the Christmas lights and have a romantic meal in a restaurant – booking a table on Christmas Eve is extremely popular! As is getting married on this day. Christmas is not a national holiday in Japan, so schools and businesses are open. There are more Christians in South Korea than in other Asian country, around 30%, so Christmas is widely celebrated. Unlike other Asian countries, Christmas is an official public holiday resulting in some adults and children not working or attending school. Department stores have huge decoration displays; and in the capital, Seoul, there are lights are all over the city centre including on the bridges over the Han River. Not every family in South Korea will have a Christmas tree, but those that do will often decorate it with lights and decorations similar to those found in Western countries. Christian churches in South Korea will hold traditional evening services on Christmas Eve as well as mass on Christmas Day, which can often include several baptisms. Presents are exchanged, though the giving of gifts has lowered in popularity. Instead, money is a popular gift. Father Christmas can also be seen around South Korea, though he sometimes wears blue instead of red! A festive dinner is a popular way to celebrate Christmas with family members, consisting of popular Korean dishes such as sweet potato noodles, rice cake soup, bulgogi and kimchi. A popular dessert is Christmas cake or ice cream cake! Visit Asia with the UK’s leading Asia Experts, Wendy Wu Tours. Our award winning escorted, fully inclusive tours visit all the major sights of Asia for an unforgettable holiday. Cambodia, China, General, Japan, South Korea, Vietnam festivals, lessons. permalink.